All the characters are from the same plantation called Greenfields and have all posted into the Apprenticeship through various means. Somehow the group has all been selected to be as part of the same squad while they do missions together. These missions are an in important proving ground for the students to graduate to Citizen status. Headmaster Crab calls the group in wee hours of the morning to inform them that a train scheduled with a beryllium is late and hasn’t checked in. The group has been instructed to find out what happened and get the train moving again. The group heads out and during the trip Castle creates a set of night vision goggles. They find the train derailed, powered down and partially wrecked. The Engineer is hidden in a locker and is terrified of some horrible creatures (Dread) that dragged the conductor away in the woods. Ezra administers first aid to the terrified man and Flin inspects the tracks to discover it seemed to be have melted by some sort of acid. In addition, Castle repairs the Repulsor to form a protective bubble and rigs it with a Burst in case the Dread show up again. A few of the group search the rest of the train only to discover the leg of what use to be a Watcher and a lot of blood, the rest of the Watchers and crew are missing. Castle climbs the telegraph pole and rigs up his datapad to transmit a distress and ask for a crew to get the train back on the track. While up there he spots two clearings off to the west. Once Ezra hears that there might be living survivors pulled into the woods he “convinces” the rest of the group along to help search. Philip stays with the survivor hidden in safety of the train cabin with the Repulsor bubble Castle rigged up. The group stumbles into a clearing where they see a very ancient dome shaped structure. 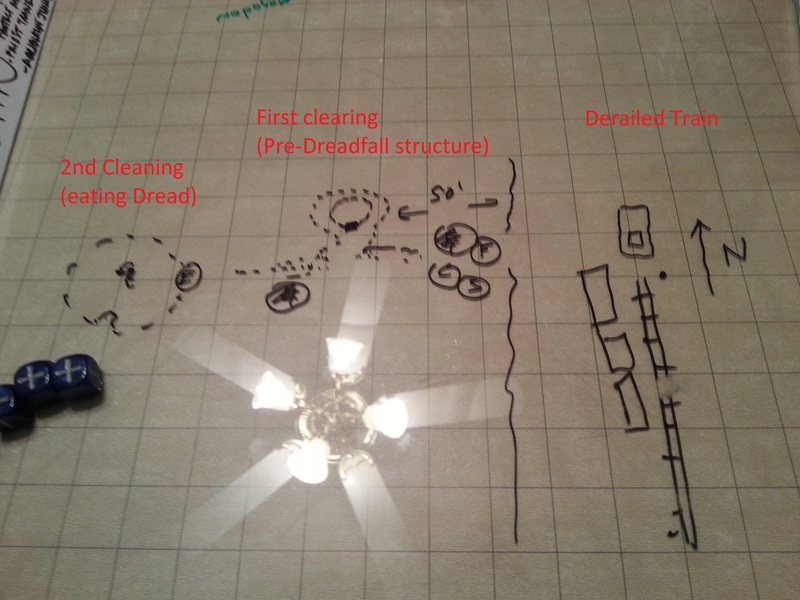 While investigating, Castle is attacked by a huge Centipede type Dread. The Dread is subsequently heavy wounded and splits itself in half and one of the half’s attempts to flee. Sam manages to take down the other half easily and the Dread is no more. 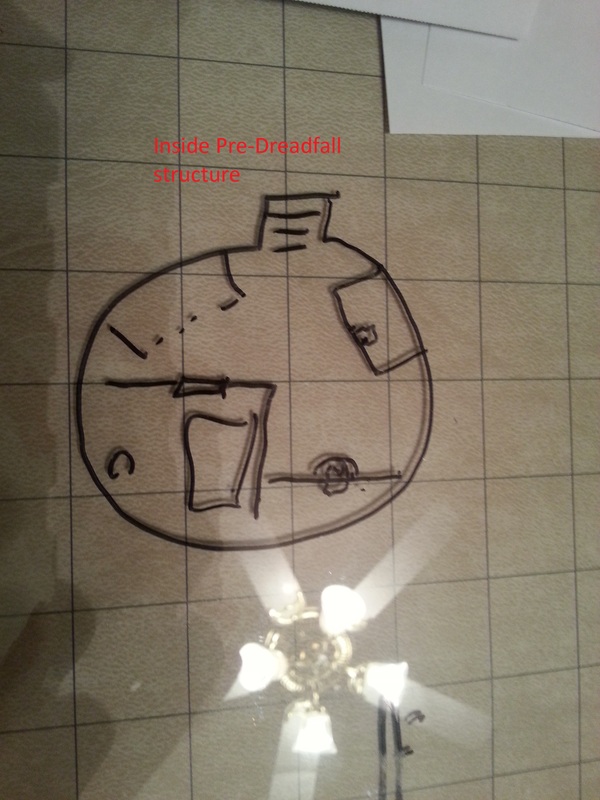 Castle discovers that the structure is indeed very old and pre-Dreadfall. He discovers two Datapads and two dead people. One person has been shot in the back of the head and another was killed by shotgun to the head. …a strange man claiming to follow ‘three and a half gods’seems to be the only person who can stand up to the creatures. Clancy says the attached coordinates are somehow important — he game me the coordinates before he died. He was eaten by monsters before he could explain why they were important. My friend, I am sorry to report that the monsters are coming your way. We cannot send anyone to assist you — we will be lucky to survive ourselves. To die at the hands of these creatures is a death most foul. I believe you have the gun you use to shoot fowl off of the comm towers? You may want to opt out if the beasts come your way. Ezra hears a blood curdling scream from the direction of the next cleaning and runs off to investigate. He runs towards the sound and finds a jet black bipedal Dread with a long elongated head, a huge set of jaws with wicked teeth, spikes protruding out of its chitinous body and a long tail( think Aliens). This Dead looks to be feasting on the missing conductor. Ezra also sees there is a living Watcher “gooed” to the tree alive, possible the Dreads next meal. Philip who has been listing over the Comm reminds the group they have the Distributor Blast and Castle thinks it will reach this clearing. Philip triggers the Blast and drives the Dread away. The Watcher is saves and turns out be none other than Flin’s enemy and rival Ronald Barker. Help of course arrives after the Dread has escaped. Castle hides the working Datapad and gives the Watchers the broken Pad and Philip gives them the pre-tech shotgun. Headmaster Obadiah Crab taunted our heroes at great length, mocking them each as a ‘Working Man.’ Here is the inspiration. Well they call me the workin’ man.